Ferret owners must pay attention to what they are feeding their furry friends in order to ensure a healthy diet and overall lifestyle. Ferret diets should be high in calories and in protein. Being carnivores, their diet should consist mainly of meat. They do not have the proper digestive systems to handle a lot of vegetable products. Their diet should also be low in fiber. 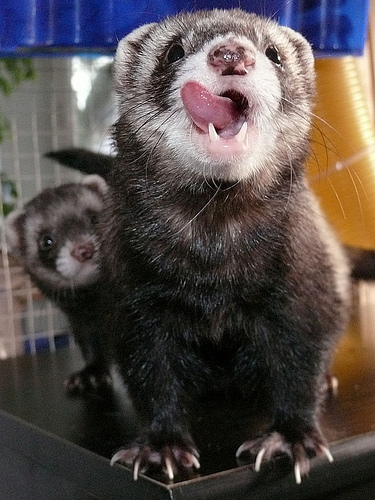 Ferrets’ feeding portions should be small and concentrated, because they have small intestinal tracts. You should start feeding your ferret a good type of food when it is very young. Ferrets like to stick to a particular food and have a consistent diet. Mixing the food up might disturb their digestive systems. Avoid buying foods with corn in them. Try to find foods with direct meat rather than meat product, because this could mean things like feathers or hooves. Until the 1980s, people would usually just feed their ferrets cat food, or foods for mink and foxes. Ferrets can eat the mink/fox diets, but these types of food are usually sold in bulk and are not easy to get in many places. Prepared ferret food at pet shops is similar to mink food, except that mink food often contains fish, which ferrets should not eat. While premium brand-name dry cat foods are okay to feed ferrets, owners should stay away from the industrial, commercial ones available at supermarkets. They would have to eat twice the amount of commercial cat food in order to get the proper nutrients, so it is not even a a good economic decision. Refrain from feeding your ferret wet cat food, as it is not good for their teeth. Dry, pelleted ferret food is a good option. Dry foods are especially good in the summer time, or if you live in a generally humid area, because it will not spoil if you leave it out for a few hours. 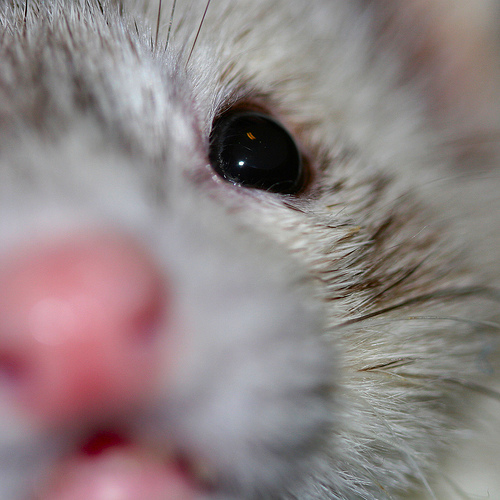 Dry foods are better for your ferret’s teeth because they do not build up and turn into plaque. Refrain from feeding your ferret dog food. Ferrets have different diets from dogs, and cannot properly digest many of the carbohydrates. There are also many nutrients particular to ferrets that are not available in commercial dog food. Ferrets should also be nourished by a constant supply of water. For every portion of dry pellets that your ferret eats, it should have three times the volume in water. They drink more water when it is warm out. Ferrets stop eating if they do not have water for 24 hours. The best way to give your ferret water is to attach a bottle to the side of its cage. Keeping a dish out will cause the water to collect things and get dirty. If you want to give your ferret snacks, some good options are cooked eggs, cooked meat, freeze-dried muscle or organ meats, or some commercially-packaged ferret treats. Owners should never feed their ferrets things like peanut butter, candy or pre-packaged human snacks like potato chips.